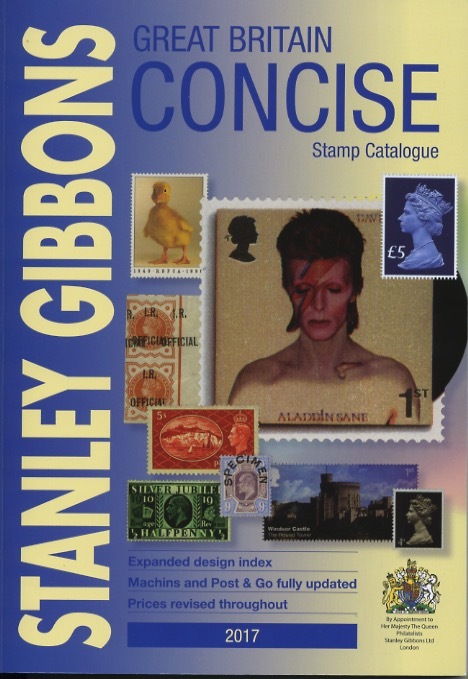 Stanley Gibbons' 2017 Great Britain Concise Catalogue now published. Concise has now reached us, with a few surprises. The first surprise was that the delay was not to allow the editors to incorporate the Machin 50th Anniversary stamps issued a week after the original publication date and available to dealers 2-4 weeks earlier. 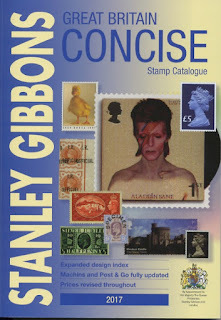 On reflection, though, and considering all the problems I and our reader-contributors had working out what was new and what wasn't, and of those that were new which would warrant full catalogue status, it makes sense for the editors to wait until they and their advisors had had plenty of time to study the stamps themselves. I think the quotes, and the definite and indefinite articles ('a', 'an' and 'the') should have been ignored. Whether this is sufficient to satisfy thematic collectors remains to be seen; including the new 2015 Smilers designs (SG MS3678) by the name of the design team seems very odd. The 'Dad' stamp, 3677, is not listed in any of the lists as far as I can see (even under the generic heading 'Smilers' which is also absent) even though it exists as a single stamp, outside the MS. In the introduction the editor provides justification for the listing of the £5 Accession anniversary stamp: in fact his justification has become unnecessary as all Post Office branches have been able (but few are willing) to order this stamp by entering the product order code. A major addition to the listings is the 5½p Wales definitive with a lower setting of the dragon and value, which makes its appearance as W21b, priced at £350 mint, £100 used. think it is a pity that the listing of international stamps is confined to the stamps denominated with the letter 'E' and excludes all those showing a weight and the airmail postcard stamp (SG2357a-9). It also excludes all airmail Post and Go stamps. I think it would be useful to show the original selling price of all these in a table which would, therefore, also show the current postage value of those stamps. The 'E' stamps were sold at a value of 30p - 40p over six years but are now worth £1.17 as postage. Inclusion of this information would help explain why the 'Fashion Hats' 'E' stamp is listed at £2 mint, while the 'higher' value of 45p is listed at £1.60 (though it doesn't explain why the 65p stamp is listed at £2.50). As usual the introduction includes a list of the catalogue numbers new stamps added (aside from new issues) but on this occasion omits to mention number changes. Within the Security Machins area of interest the 1st class gummed Diamond Jubilee stamp from the prestige book (Norvic 3328) has been moved from the main commemorative area to the Machin listings, changing from 3328 to U3279. With U3012, the 5p from PSBs, included as the lowest value in the Beatrix Potter book, the pane that it is in has been numbered U3012d. This has required the Enschede Merchant Navy 5p with elliptical perforation inverted to be renumbered from U3012d to U3102g. I have not noticed any other re-numbers of individual security stamps. Stamps printed on both types Security-printed Backing Paper (SBP) are now listed in John Deering's tables although those stamps which exist both with and without, or with SBP1 and SBP2 are not given full catalogue listing as individual stamps. However in the booklet listings, not only are booklets with SBP separately numbered, but if they are first issued with SBP1, those with SBP2 have been allocated a sub-number. Post and Go stamps listings have been given a major makeover seemingly out of proportion to the number of people now interested, although the introduction warns that "as these machines become ever more ubiquitous... we have had to draw a line and limit the tables to those categories already established." This is in line with the suggestion of John Deering in Gibbons Stamp Monthly (with which I disagreed) last year, in which he claimed that the transport museums (and hence the Shakespeare Centre) were not as worthy as the Armed Forces Museums because of the latter's close association with The Queen. I'll leave others to review the new listings and tables (and I am happy to publish a guest-blog on that subject! As usual the Concise is essential reading for those who want to keep up to date and know what Gibbons and other dealers are using as their main reference and price guide. I'll leave readers to decide whether the prices reflect the market: I suspect for the U-series Machins those prices will not be far ahead - or behind - the market! The latest edition of the Norvic Machin Security Checklist (v1.6.1) is now available for download. I wonder what suddenly motivated this one to be listed in the Concise, given that its a well recorded stamp and has been for a LONG time?! From what I have found out most dealers are asking £175 for a mint copy, maybe they have a good stock of these?